The Oklahoma Climatological Survey (OCS) provides outreach programs and educational materials to public safety agencies, agricultural interests, educators, and the general public. These include OK-FIRST, which provides weather data and training to public safety agencies; EarthStorm, a program for educators that integrates learning modules with real-time weather data; and Agweather, a website that provides information to help agricultural producers with weather-related decisions. The site also features a glossary of weather terminology, a set of lesson plans, and reference materials intended for use as refresher information by teachers. 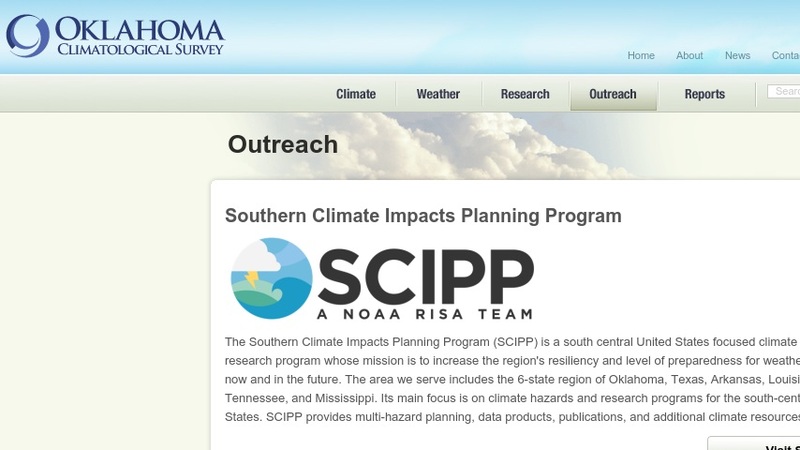 Other resources include information on tornado safety, case studies on the use of OCS training materials, and a set of maps and graphs with climatological data and information on severe weather phenomena.